Honest Burgers.. It Would Be a Crime Not To Visit! Believe it or not, I have something in common with the following people. Micky Dolenz ( he of Monkees fame ), Paul McCartney ( he of marrying a one legged loon fame ), Sheena Easton ( 1980s pop star whose most popular song was a cover of a Dolly Parton hit, 9-5 ), and lastly, Kerry Katona ( the one off of the Iceland adverts who constantly claims bankruptcy and has had more chances than a monopoly board game! )… So what is it? Well, we all got married in 2002. In the 14 years that have passed since, Katona has gone on to claim a hat – trick of hubbies ( poor souls ), and McCartney has split from mad Mills and is I believe due to take the plunge again very soon. He must be running out of money!… Myself and GB, that’s her indoors for those unaware, will celebrate 14 years of wedded bliss on Monday ( she may beg to differ on the bliss part ). We have been together for 25 years, and before you think or say it, I know, people get less for life. You know what though, I wouldn’t change a thing. Of course we have our moments but who doesn’t ?… I guess the difference between us and the likes of Katona is that every time we have a moment it doesn’t end in divorce! Our last “disagreement” was on Thursday. I don’t imagine we are the only people to have a heated conversation over the topic. Since Thursday we have had no gas. National Grid have disconnected our gas supply. I won’t go into the reasons as to why short of saying this. it’s not a financial thing. National Grid have arranged with no residential consultation to change the mains gas pipe in our street. Ours is proving more difficult than others to replace, and irrespective of it being the coldest week of the year they have decided to cut our supply regardless. Luckily we have a log burner so warmth isn’t an issue. Hot water and a shower however, that’s another story. The beaten track I lead you off of. Back to the correct pathway… It’s our wedding anniversary , have I mentioned that yet? This year GB had organised our celebratory plans. Saturday afternoon involved a visit to the “Crime Museum Uncovered” exhibition at the Museum of London. Tickets were just short of 20 quid each inc the booking fee. I will give you my honest opinion. Our booking/appointment time for entry was 15:30. It was overly crowded meaning you struggled to get a real decent look at anything. An hour later, it was less busy and therefore worth considering if you were thinking of paying it a visit. It’s not necessarily what I expected but I did enjoy it. We both did. With a dodgy back following a small op I wasn’t looking forward to a lot of walking. Luckily it wasn’t in a huge space and was well thought out. Plus there was seating for those of us needing to take the weight off our plates now and again. The exhibition details the start of the Metropolitan Police and how it has evolved since. Without giving too much away I would say this. The last area before the exit makes you think about what is around you and the importance of it. Personally I wasn’t really appreciative of what surrounded us until this point. There are some real interesting and eerie artefacts in there. Personally I loved the “Great Train Robbery” piece. The more up to date stuff on terrorism sends a shiver up the spine. We never knew for instance the Hyde Park bombing in 1982 was on GB’s birthday. Overall the burning question is, is it worth the wonga? … Hand on heart, I would say pay your money and make your own decision. I wouldn’t visit again, BUT I’m very happy I’ve been. It was an educational experience. We had arrived in Liverpool Street with plenty of time to spare. The museum was a 10 minute walk away and we were both Hank Marvin. Having not eaten properly the previous evening due to an impromptu visit from neighbours, and with no cooking facilities thanks to National Grid, breakfast had passed us by. On a few occasions that I’ve been around this area I’ve often passed by the Honest Burgers restaurant in Widegate Street on my way to Spitafields. More importantly I’ve wanted to try it. With an hour to kill and both of us being hungrier than a carnivore at a vegan convention, I threw my hat in the ring suggesting a visit. It took less than a minute to get there and within 6-7 minutes we were seated on a large communal table in front of the kitchen area with four more stragglers. It was a busy old place but the service was swift and attentive. GB had a Diet Coke ( served with a straw in the can ), while I had a pint of the Beavertown Pale Ale, purely for research purposes of course. I’m no connoseuir of real ale but I think HB have a winner on their hands. It certainly wasn’t a struggle to drink. Then the main purpose for us being there, the food. GB ordered a Tribute ( no onion ) and a side of Apple, beetroot, red cabbage coleslaw. 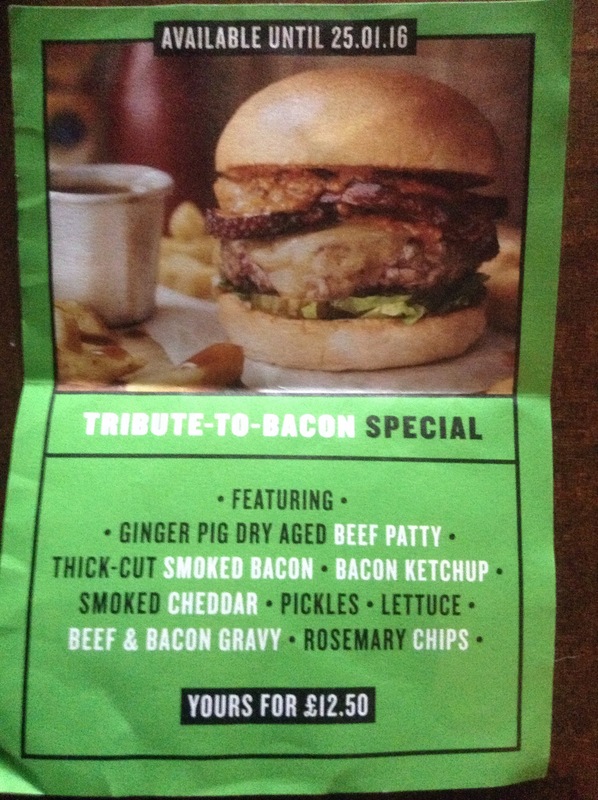 I went for the Tribute-to-Bacon Special ( see picture for details of what’s in it, although I had no pickles or lettuce ). Both meals came with Rosemary Chips, and all jokes aside they were chips fit for a Las Vegas poker table. Completely knockout. The Beef & Bacon Gravy.. It’s so nice it should be illegal. I’ve not even touched on the burger yet! Well the burger itself was pink inside, perfectly cooked. The flavour was full on. I would go as far to say it’s THE best burger I’ve eaten, and I’ve had a few. The bacon ketchup was delicious and I don’t even like ketchup. The brioche bun was light and fluffy with a slight crunch. I nearly forgot the onion rings. I loved the onion rings. Both GB and me would have given it 10 out of 10 if it wasn’t for waiting for a table and then hanging around to pay the bill. So we are going for 9.6 out of 10. It was as close as it could get. The staff were friendly, and I like the fact that the lady who took our order wrote nothing down, but the food came out exactly as requested. You really need to get to Honest Burgers, no porkies!…. There was one downside to all this. We had a restaurant booked for 19.30 and were both absolutely stuffed. What a place though. Next up… What we did in the evening, the celebrations continue!… Happy reading!